For the dressing: Whisk together the white wine vinegar, mustard, sugar and salt and pepper to taste in a large mixing bowl. Whisk in the olive oil in a slow, steady stream until thickened and emulsified. Whisk in more salt and pepper to taste as needed. 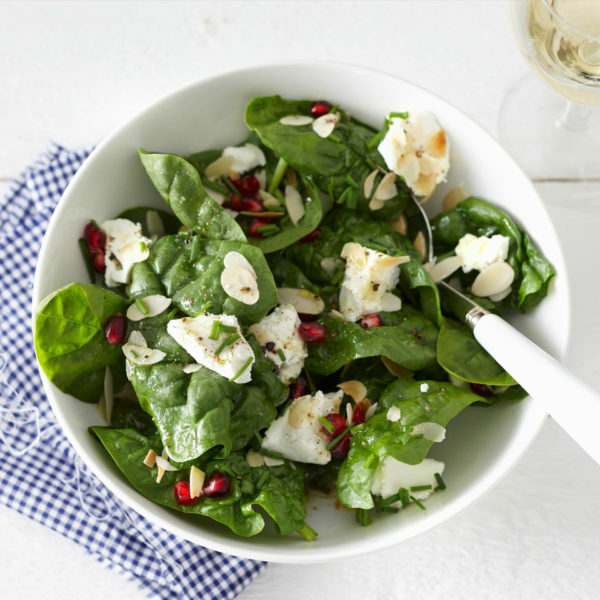 For the salad: Add the spinach leaves, pomegranate seeds, sliced almonds and chives to the dressing. Toss well to coat. Break the soft goats' cheese into chunks and add to the salad. Toss again before serving.